All aboard! 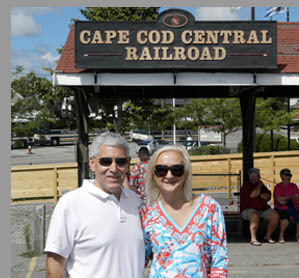 The Adventure Kids aka Debra C. Argen and Edward F. Nesta experienced Cape Cod, Massachusetts on the Yankee Clipper Brunch Train, one of the many rail offerings from the Cape Cod Central Railroad, where we enjoyed a 2-hour scenic ride and a delicious Sunday brunch. What a perfect way to start the day! We love Sunday Brunches; maybe it is the food, or maybe it is because it is the one time where we actually take time to relax and enjoy a leisurely late morning meal. When we heard about the Cape Cod Central Railroad Sunday Brunch in a vintage railcar, we knew that this was something that we wanted to experience. The Cape Cod Central Railroad celebrated its centennial anniversary in 2014 and what an incredible history with interesting stories to tell! 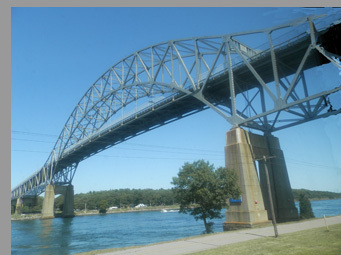 "In 1848 the Cape Cod Branch Railroad started running to Sandwich. Rail service has ebbed and flowed since that time. In 1861, Cape Cod Central Railroad was formed and the tracks reached Orleans. In 1872, the rails ran all the way to Provincetown at the tip end of the Cape Cod and south to Woods Hole. All passenger service ended in 1959 and in 1982 seasonal and scenic service was revived. In 1999, Cape Cod Central Railroad became the leading Dinner and Scenic trains in the country." As brunch is always better shared, in mid-August 2014 we traveled to Cape Cod, Massachusetts and invited Peter and Joanne Moskal to share the experience with us. Comfortably seated in the vintage 1937 Great Island Dining Car named after Cape Cod's Great Island on the Cape's South Side, we settled back and looked forward for the ride to begin. The vintage car featured tables draped with white linens and accessorized with vases of pretty freesias to complement the stunning scenery. 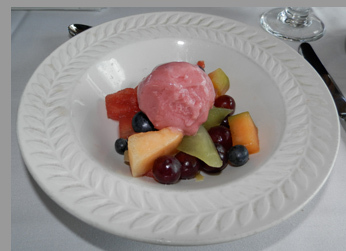 The brunch menu included a refreshing fruit medley of pineapple, cantaloupe, honeydew, and grapes with raspberry sorbet, a choice of entrée, dessert, and a choice of coffee or tea. Entrée options included Eggs Oscar, Roasted Vegetable Manicotti, Breast of Chicken Cadillac, which was sautéed boneless breast of chicken finished with an Alfredo sauce, topped with julienne of ham, puff pastry and hollandaise sauce, Omelette Homard, which was sautéed lobster meat, grilled asparagus and cheddar cheese omelet, and for children, they offered Choo Choo Charley's Crazy Chicken Fingers with Boxcar Willy's Wacky Mac & Cheese, which included one juice box and serving of ice cream per child. As brunch selections are pre-ordered at the time of booking, we were able to relax and enjoy the ambience. 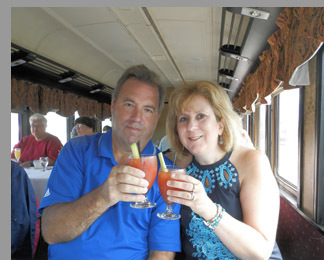 Before the train departed the station, the wait staff came by to inquire if we would care to purchase a Mimosa or a Bloody Mary to start our journey, and being in a celebratory mood, we each ordered a Bloody Mary to toast each other and the beautiful weekend. Soon the train was cruising along with pretty scenic views of the Cape Cod Canal, started in 1909 and completed in 1916, and views of the Sagamore Bridge which spans the canal and connects Cape Cod to mainland Massachusetts, which we enjoyed with the fruit medley and sorbet, and the narrated tour. 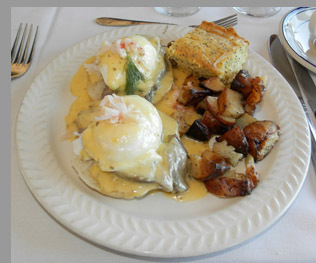 Entrées soon followed, and for Peter and Edward there was Eggs Oscar, which was two English muffin halves topped with sliced tenderloin of beef, poached eggs, crabmeat, and finished with a béarnaise sauce, and served with a generous portion of lemon poppy seed cake. 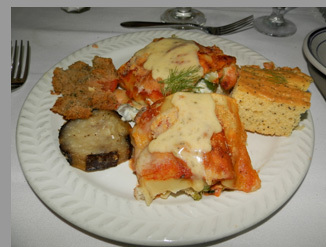 Joanne and Debra had entrées of Roasted Vegetable Manicotti made with mascarpone cheese and served with grilled eggplant and tomato Provencal, and very moist and tasty lemon poppy seed cake. 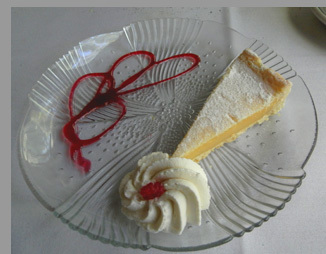 For dessert, there was key lime pie and coffee to end the ride on a sweet note. Along the way, we learned about the history of the area and about the Cape Cod Railroad. 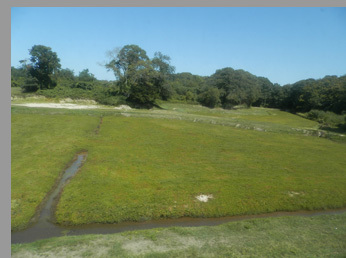 We thoroughly enjoyed the narration during the trip as well as the scenery as we passed the salt marshes and learned about the famous cranberries that grow in Cape Cod. Cranberries grow in bogs, and in August, the berries were still small and light pink. Harvested in October when they are red and ripe, cranberries are either "wet" or "dry" harvested. Wet harvesting is when they flood the bogs, like you may have seen on Ocean Spray® Cranberry Juice commercials where the men are standing in a flooded area with cranberries floating on the top of the water and is the method used for juice. Dry harvesting is used to pick the berries for other purposes. The trip was very interesting for the historical information as well as for providing us with the perfect experience to absorb the culture and the beauty of Cape Cod, while enjoying a delicious brunch, and of course, excellent company. 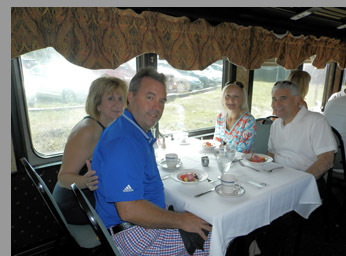 The Yankee Clipper Brunch Train runs on Sundays at 11:30 am from May 11 until October 26. Adults: $55, Children: (Ages 2-12): $33. Private Tables are available for an additional $20, Please call to reserve a private table. The Cape Cod Central Railroad has many different experiences from which to select. 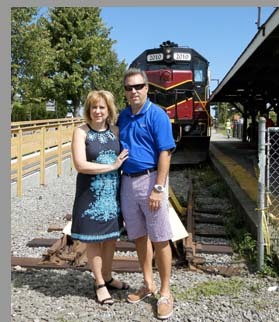 The Shoreline Excursion Train is a narrated journey with fun facts, history and a whistle stop in Sandwich or a full 2-hour ride option. 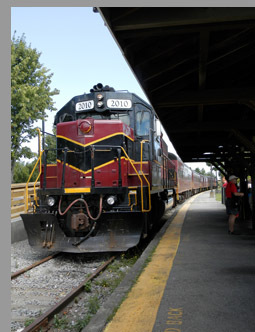 The train departs from Hyannis, and runs from May 10 through June 1 on Saturday and Sunday, and from June 3 through October, they operate on select weekday and weekends. Check website for dates and times. The elegant and romantic Cape Cod Dinner Train with candlelight featuring a 5-course meal, departs from Hyannis June through October on Thursday and Saturday, and departs from Buzzards Bay on Friday during July and August. The Colonial Lunch Train features a 3-course meal including Cape Cod Central Chowder runs on Saturday from May 10-31, and from June 3 through October 25 on Wednesday and Saturday. The Family Supper Train with menu selections for adults and kids as well as music and on board entertainment runs on Wednesday from July 2 through August 27 and departs from Hyannis, and during July and August runs on select Fridays and departs from Buzzards Bay. The Yankee Clipper Brunch Train features a 3-course meal, and operates from May 11 until October 26 on Sundays at 11:30 am. For the holiday, The Train To Christmas Town is complete with Santa visiting the train with departures in November and December. 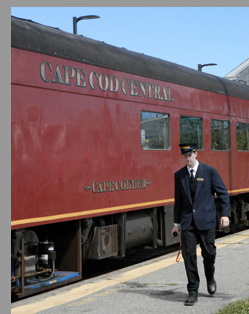 For more information on Cape Cod Central Railroad and their different programs, days, hours of operation, and pricing, please visit the website: www.CapeTrain.com. Read more about Cape Cod and the area in the Destinations, Performances, and Music Scene sections. Hyannis, Massachusetts is located 33 from Plymouth, Massachusetts, 71 miles from Boston, Massachusetts, 75 miles from Providence, Rhode Island, 183 miles from Portland, Maine, 255 miles from New York City, 351 miles from Philadelphia, and 399 from Montreal, Canada. For more information on Cape Cod, please visit the Cape Cod Chamber of Commerce website: www.CapeCodChamber.org. © October 2014. Luxury Experience. www.LuxuryExperience.com All rights reserved.